Hey guys! Welcome to this video on 3D Geometric shape identification. First, what we will do is take a look at what a 3D shape is, then we will look at the different properties of a 3D shape. Let’s do a quick review. A 1D just has a length. 2D only has length and a width. So, what is a 3D shape? Well, 3D stands for three dimensional; those three different dimensions are: length, width, and depth (or height) for a Polyhedron, and base, radius, and height for a curved three dimensional shape. A polyhedron is a three dimensional shape with all flat faces. A curved three dimensional shape would be like a sphere, cone, or cylinder. In this video we will focus on polyhedrons. Length refers to the measurement of something from one end of a segment, all the way to the other. Width refers to the measurement of something from one side of a segment, to the other side. Depth (or height) refers to the distance from the top of a segment to the bottom. Now, let’s talk about the properties of a three dimensional shape. Three dimensional Polyhedrons have faces, edges, and vertices. A face refers to the surface of a three dimensional shape. A cube has 6 faces. Edge refers to the where two faces connect. A cube has twelve edges. A vertex (or vertices when you are referring to more than one) are the corners, or where the edges come together. A cubes has 8 vertices. Understanding 3D shapes and their properties are very important, and will help you to do much more, like calculate volume. 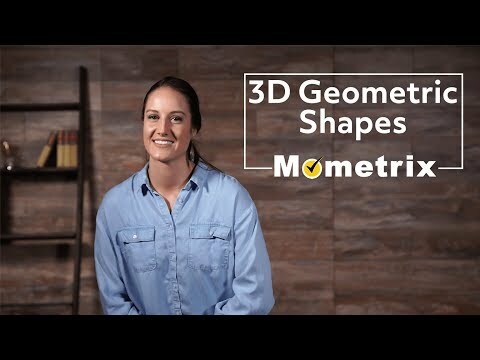 I hope that this video over 3D geometric shape identification was helpful. If you enjoyed it, then be sure to give us a thumbs up, and subscribe to our channel for further videos.